Swansea City have appointed former Udinese manager Francesco Guidolin as their new head coach. The Italian will have the final say on selection while working alongside Alan Curtis - who had been placed in interim charge - until the end of the season. Swansea, who sacked Garry Monk last month, are 18th in the Premier League. Guidolin, 60, was at the Liberty Stadium for Monday's game with Watford but a club statement said he would only have a "watching brief". "At the moment it's not a good situation for the club, but we have a good team," Guidolin told the club's website. "In Italy, I helped my team finish in a good position in the table, and that's what I hope to achieve here at Swansea. "At the moment everything is new to me, so I need three or four days to talk to the staff and players. After that, I will have a precise idea of things. "Alan Curtis is a legend at Swansea, and this is important for me. He knows everything about the club." Former Chelsea midfielder Gabriele Ambrosetti has joined Swansea's staff as coach following Guidolin's arrival. The south Wales club placed Curtis in caretaker charge after Monk's departure and then announced on 7 January that the 61-year-old would continue as interim boss until the end of the season. But after the 4-2 home loss to relegation rivals Sunderland, Curtis said he would be willing to step aside if the club found a new boss before the end of the campaign. Guidolin has managed several clubs in Italy dating back to the late 1980s, including Palermo and Parma, as well as French league side Monaco. He took charge of Serie A side Udinese over two spells, first in the late 1990s and then a stint from 2010 to 2014. 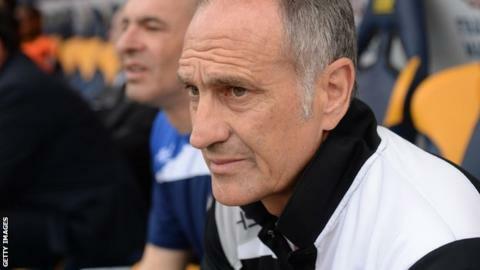 Udinese finished third in Serie A under Guidolin in 2012, equalling the club's best season in the Italian top flight. He also achieved promotions with Parma, Palermo and Vicenza, and led the latter to an unlikely victory in the Coppa Italia in 1997. Swans chairman Huw Jenkins travelled to South America in December to step up his search for Monk's successor, with Marcelo Bielsa the bookmakers' favourite for the role. After the appointment of Guidolin, Jenkins said: "His experience and knowledge will be a huge asset to the club. "He has an excellent record, especially with Udinese over the last few years. He created an Udinese side from a relatively small budget - compared to the rest of the league - that competed with the big teams in Serie A. "He instilled a belief and motivation to compete and beat the best Italy had to offer. It is similar to what this football club is trying to do in the Premier League." Swansea host Watford in the Premier League on Monday, before travelling to Everton on Sunday 24 January. Having been knocked out of the FA Cup by League Two Oxford, Swansea do not have a fixture over the final weekend of January. They then travel to West Bromwich Albion on Tuesday 2 February before back-to-back home games against Crystal Palace and Southampton.